My last post featured some new OPI shades that I've added to my collection and I did mention that some nail art featuring some of these shades should be popping up soon. I couldn't wait to try Kiss me - or Elf! (and judging by your comments it was a popular one with you too) so today I have a glitter gradient look featuring this one. I've attempted a glitter gradient before but it didn't really work and came out as more of a block of glitter that to be honest looked a little silly. 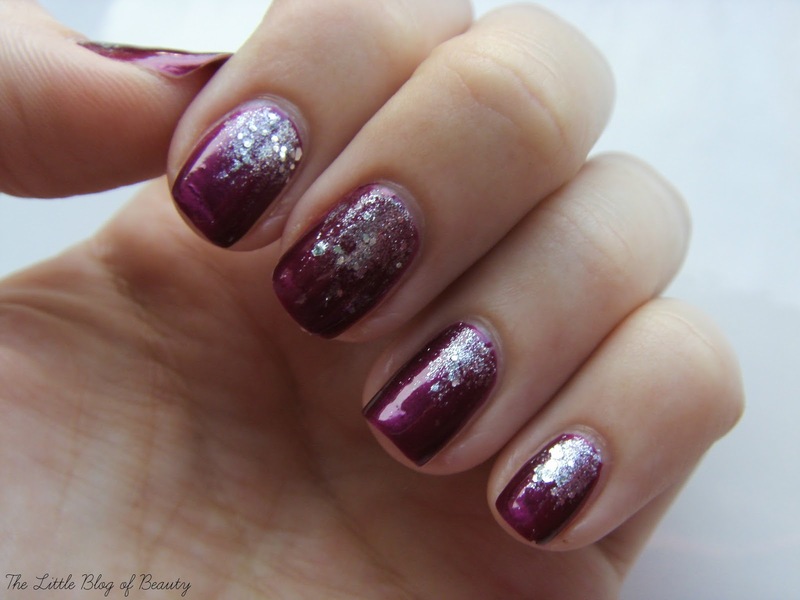 So I took to the blogs of some of my favourite nail artists to look for a glitter gradient tutorial. I did indeed find one although unfortunately I can't remember whose blog I found it on. The key appears to be reducing the amount of nail varnish on the brush so you're left with some glitter and very little varnish. You can do this by repeatedly wiping the brush against the neck of the bottle, like you would usually do to make sure you have the amount of nail varnish on the brush that you want before painting each nail. You then use the brush to dab the glitter onto the nail. Depending which side of the nail you want the gradient you either start near the cuticle or the tip, dabbing the glitter on where you want a fuller coverage and then pull the brush up/down the nail a couple of times to lightly spread some of the glitter up/down the nail making the gradient. You will have to keep repeating this, dipping the brush back in the bottle again, to build up to the effect that you want. The only problem I did encounter was the second time I did this I discovered that the neck of the bottle started to become very clogged up where I was wiping most of the nail varnish off the brush. I haven't attempted to open the bottle again since but I think it could well now be 'glooped' shut! Another tutorial I found suggested dabbing the brush against a piece of kitchen towel/paper to absorb the extra nail varnish. At the time I thought this was a little wasteful, but now in hindsight that might be a better idea to prevent your glitter nail varnish becoming unusable after a few glitter gradients. Isn't Kiss me - or Elf! a beautiful shade! Love the look of your site everything is so pretty. These nails look lovely, may have to give them ago tonight i think!